To play this white board game, you need a computer and projector to show the slides, small white boards for each students or for each pair of students, dry erase markers, and erasers. This resource has 61 slides, including title slide, instruction slide, and key slide at the end. 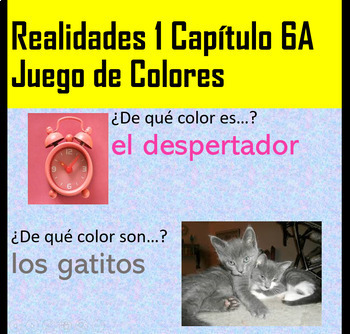 Each of the game slides says, "¿De qué color es/son…?" and then has a picture and a label. 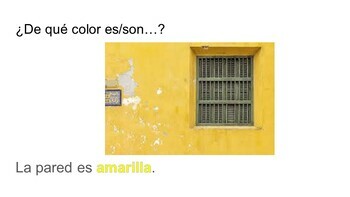 Then there's an answer slide with the picture and the color written with the correct gender/number to go with the noun. I used most of the nouns from the first section of the vocab page from this chapter (alfombra, cama, estante, etc.) 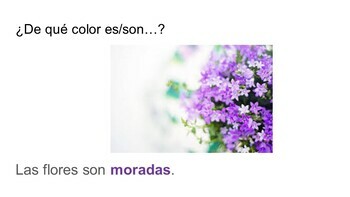 as well as a variety of other words (flores, osos, zapatos, lapices). There's a mix of singluar, plural, masculine, and feminine nouns so that students have to know and spell the color right and make it agree in gender and number with the noun it's describing. When I play this game with my students, I split the class into three balanced teams. I either give each student a white board or each pair a white board, a dry erase marker, and an eraser. If we're doing pairs, they have to trade back and forth so that everyone is writing. Students must write big and clearly enough that the judges can easily read. I also choose two students who get an answer sheet, stand in front, and act as judges. It's impossible for you as the teacher to switch the slides and see every single board at the same time, so trust me, you want student judges! I also make a rule that teams lose a point if they argue with the judges. I find that the kids make good judges and work hard to be fair. I only step in if there's disagreement between judges. I give two teams points for each slide. The first two teams to have all of their boards correct get a point. I've found that if I only give one point per slide, students start to get discouraged and sometimes stop trying if one team starts to dominate.